This ten night holiday has been carefully crafted to cleverly balance cultural highlights and historic treasures with natural beauty and stunningly scenic cycling. It's a perfect choice too if you like the idea of combining timeless countryside cycling with the use of local transport to explore the eternal cities of Siena and Florence on foot. Your holiday starts in Volterra, a real Etruscan gem with its tangle of alleys home to alabaster workshops and secret chapels, in the heart of the Era Valley. You'll pedal through the archetypal Tuscan countryside, cypress dotted rolling hills, olives, vines, sunflowers, and on, via postcard-pretty Certaldo, to Colle di Val d'Elsa where you'll spend four nights. From here, you can enjoy day trips to the great art cities of Florence and Siena before pedaling on through panoramic wine country to the tiny hamlet of Pescille, a short cycle from mediaeval San Gimignano. Your route then takes you through the Castelvecchio Nature Reserve (great for bird spotting) giving you a real sense of achievement as you loop back to Volterra for your final night. The hotels we've selected for this holiday are among our best, and include a magnificently restored 12th century abbey, a wonderfully renovated, stylish watermill which dates back to the 16th century and belonged to the famous Medici family, and a family-run, traditional hotel overlooking the soaring towers of San Gimignano. As Chianti is synonymous with great food and wine, we've made sure evening meals are a celebration of local flavours throughout. Arrive in Volterra where you've time for a dip in the hotel pool and a wander round the town's tangle of cobbled alleys and hidden squares before dinner. Today it's a downhill whizz out of hilltop Volterra and into the pretty Era Valley where spectacular views of the surrounding timeless Tuscan countryside open up as you pedal. After climbing out of the valley, you'll soon pass through the pretty hamlet of Castagno where we suggest a well-deserved coffee stop in the local bar. Your route continues on to Gambassi Terme, a well-preserved spa town with cobbled streets, C12 church and lovely shaded gardens. Lunch here perhaps in one of the many trattorie then, soon after leaving the town, you'll pick up the famous Via Francigena for the gentle, mainly downhill stretch to mediaeval Certaldo. RIDE PLUS - 75km / 47mi Leaving Volterra your route drops down into the valley before heading north, passing the Theatre of Silence and the family home of Andrea Bocceli and then passing through rich green meadows and stunning countryside. On to the pretty spa town of Gambassi Terme and then a long downhill ride into medieval Certaldo, to your hotel for the next two nights. Explore stunning Certaldo, Boccaccio's birthplace. Split into two distinct halves, the mediaeval centre of Certaldo Alto with its fabulous ancient buildings, is accessed by funicular and offers spectacular views across the Val d'Elsa. On the other hand, Certaldo Basso is the more modern part of the town with shops, bars and restaurants. You could also spend time today, relaxing by the hotel pool. Today's route explores the panoramic wine country between Certaldo and Colle di Val d'Elsa. You'll follow the official, mainly off-road, Chianti Wine Route where you'll find lots of tasting opportunities - don't forget, we can collect any purchases for you! It's then on to the old town of Poggibonsi, a perfect stop for lunch and to visit the ruins of its unfinished C15 fortress. The day ends with gentle pedalling through tree-lined meadows and a valley of poppy and sunflower fields to Colle di Val d'Elsa. RIDE PLUS - 100km / 62mi (shorter routes available) Today you head up to Pancole and then into wine country - a beautiful ride, with vines as far as the eye can see, passing through beautiful hamlets and interesting wine towns. With the climbing over, you pass two of the famous Chianti towns, Castellina and Radda, both offering great wine tasting opportunities and good restaurants. There is so much to see and do in and around Colle di Val d'Elsa that you really will be spoiled for choice. However, today we recommend hopping on the local bus (from just outside the hotel) for the 30min ride to the great mediaeval city of Siena. Visit the Palazzo Pubblico with its impressive pre-Renaissance frescoes and climb the Torre del Mangia for the best views of the town and surrounding Sienese countryside. For lunch, or simply a drink, there is no better place than Siena's beautiful shell-shaped Piazza del Campo. After a fairly long day yesterday, we propose that you spend a relaxed morning in Colle di Val d'Elsa. The historic town dates back to Etruscan times with a cathedral, museums and fine Renaissance buildings. After lunch in the old square, maybe spend some time by the pool before a pre-dinner stroll along the lovely River Elsa where limestone-rich rapids come crashing dramatically downstream. No trip to Tuscany would be complete without a visit to the charming city of Florence, arguably the most beautiful city in the world! It's just an hour on the local bus (which leaves from just outside the hotel) giving you plenty of time to explore the Uffizi (closed Mon), Duomo and Baptistery. If you want to escape the crowds, we suggest you cross the Ponte Vecchio to the quieter side of the Arno to visit the Boboli Gardens. Get back on your bike this morning and enjoy superb rolling views before the ride up to Casole d'Elsa, a beautiful village characterised by ancient vermilion-hued buildings and blessed with stunning views from its hilltop position. Take time to explore its C12 church (frescoes by Gano da Siena) and impressive fortress before an early lunch perhaps in the lovely piazza. You then wind north through wonderfully scenic countryside, the fabulous mediaeval towers of San Gimignano providing a formidable backdrop as you pedal on to Pescille. San Gimignano is just a short cycle away, its towers giving this hilltop town a distinctive Manhattan-style skyline. Explore its myriad of narrow streets and many hidden cobbled squares before popping back to your tranquil hotel for a refreshing dip in the sparkling swimming pool. 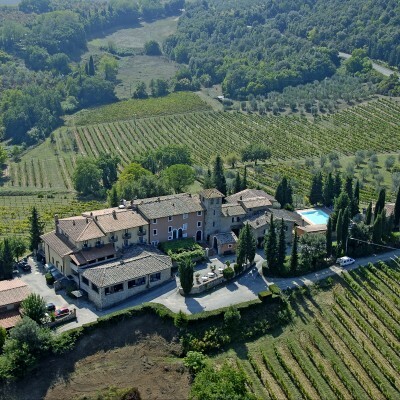 It's a short downhill ride to San Gimignano before a gentle climb up through classic Tuscan landscapes of vines, olive groves and fields ablaze with sunflowers. It's then an almost entirely downhill cycle into the pretty Era Valley. There's a real sense of achievement on your final pedal through open countryside, enjoying spectacular views, before your last climb back to the ancient cobbled streets of Volterra. RIDE PLUS - 59km / 37mi From the hotel you head towards San Gimignano, circling the 'town of towers' for 360 degree views of the surrounding area. Pass through wine country before an uphill stretch, followed by a long downhill with views of Volterra. Finish with a climb into Volterra itself, passing through the town and back to your hotel for the last night. The 4 star Park Hotel Le Fonti is located just below the Porta dell'Arco entrance to Volterra's beautifully preserved mediaeval centre. It's an easy 10 minute stroll into arguably one of Italy's oldest towns. The hotel has over 50 comfortable rooms, all of which are furnished in a simple style with terracotta floors and elegant fabrics. All rooms have ensuite facilities. The real highlight of the hotel is the breathtaking view from the terrace and fabulous infinity pool - the sweeping panorama over the rolling Pisan hills is truly outstanding. Room upgrades: Deluxe Room with Terrace, Junior Suite or Suite. Deluxe rooms with terrace have their own terrace overlooking the pool. Junior suites are much larger than a standard room, with a sitting area. The suite is situated in the tower, and is larger than a junior suite. It has a balcony and a jacuzzi. Located on the fringe of Certaldo Basso, on the River Elsa, the stunning 4* Hotel Certaldo dates back to the 1500s when it belonged to the infamous and all powerful Medici family. It started life as a water mill and signs of its original use are still in evidence, including its mighty water wheel. Over the 20C, the mill was used as a power turbine and produced enough electricity to service the entire town of Certaldo up to the 1950s! The mill was lovingly restored and converted into a hotel in 2007 and now boasts 30 modern and stylish rooms with all the amenities you would expect of a comfortable 4* hotel. There is also a pleasant garden (with pool) and terrace area overlooking the river, and a lounge area with tv and books where you can relax after a day's exploring. Room upgrades: Superior Room, Deluxe Room or Junior Suite. Superior rooms are larger than standard rooms and have a minibar and free wifi. Deluxe rooms are larger than the superior rooms, they also have a minibar and free wifi. The Junior Suites are larger than all the other room types, they have a minibar and free wifi. 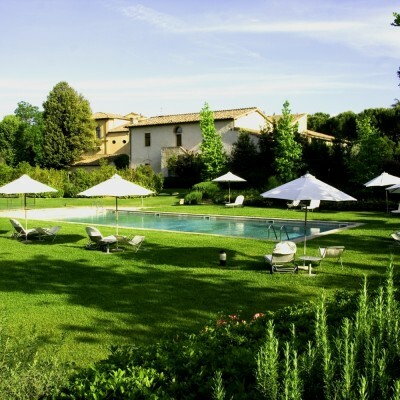 The Relais della Rovere is a stunning 4-star hotel located at the edge of Colle di Val d'Elsa. The Cellerai family have sympathetically converted this C12 Benedictine Abbey into a 31 room luxurious hotel, retaining many of the abbey's original features. The bedrooms are split between two buildings and decorated in a contemporary style with wooden floors and beech furniture. The rooms are quite large with ensuite facilities. The hotel has a lovely outdoor pool which is surrounded by pleasant gardens. Room upgrades: Luxury (Double Only), Junior Suite or Suite. Luxury rooms are located in the Renaissance Villa and feature antique furniture and prints, and precious tapestries and ceilings with encased beams and parquet flooring. Large windows with a view over the historical centre of Colle Val D'Elsa. Bathroom with whirlpool bath, courtesy kit, bathrobe and slippers. Junior Suites are located in the Benedictine Convent and in the farmhouse. They comprise an entrance hall with living room and one double bedroom, and feature modern, solid oak furniture. They have beamed ceilings and parquet flooring. One/two bathrooms, one with shower, the other with whirlpool bath, courtesy kit, bathrobe and slippers. Suites are in the Benedictine Convent and in the Villa. They are larger with an entrance hall, living room and sofa bed and a double bedroom, with two bathrooms. Some have modern decor with solid oak furniture, beamed ceilings and parquet flooring. Others feature antique furniture and prints, and precious tapestries, ceilings with encased beams and parquet flooring. 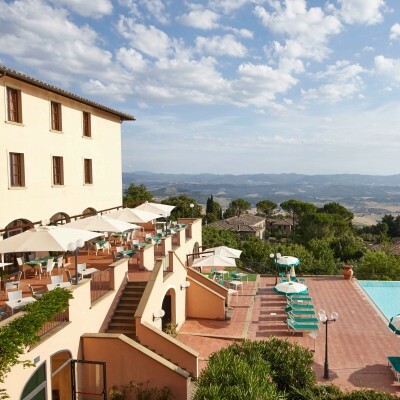 The Hotel Pescille is located just 4km outside San Gimignano, in the heart of the Tuscan countryside, surrounded by olive groves and vineyards. It started life as an old farmhouse before being converted into the 3* hotel it is today. Evidence of its origins still remains however, with its ancient tower housing the hotel's small agricultural museum. There are pleasant gardens surrounding the hotel - with lovely views of the surrounding landscape - and it also benefits from an outdoor swimming pool. All rooms at the Hotel Pescille are ensuite and are simple yet spacious with tiled floors, whitewashed walls and pristine white linen; air conditioning. satellite TV, minibar and hair dryer also all come as standard. Rooms have views onto either the timeless Tuscan countryside, or the roofs and mediaeval towers of San Gimignano itself. The hotel does not have a restaurant open for dinner, we have therefore arranged for you to have return taxi transfers to the centre of San Gimignano, where there is a wealth of restaurants to suit all budgets and tastes. Room upgrades: Double with view of San Gimignano. Rooms with balcony offer wonderful views of San Gimignano. 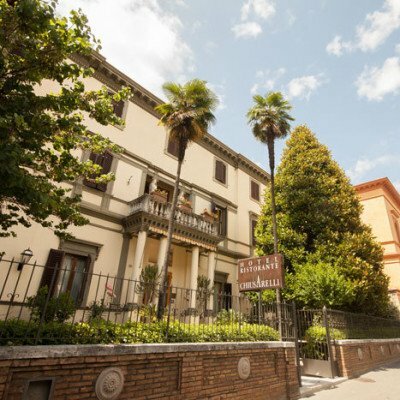 The Hotel La Luna is a friendly hotel, tucked away in a quiet side street, just off the atmospheric Via Fillungo, the most sophisticated and exclusive street in Lucca's historic centre. The original part of the hotel dates back to the 1200s when it was built elsewhere and then 'moved' about a century later to its present location. It now comprises of 2 buildings, with the 29 en suite rooms divided between the two. Breakfast is taken in the buffet breakfast room in the reception building, where there is also a small bar. Hotel Chiusarelli is located just beyond Siena's mediaeval walls and a ten-minute walk away from town's main square, Il Campo. Its position on the edge of the historical centre is perfect as the hotel is spacious and quiet but still within walking distance of all the sights and restaurants. There is even a small garden to the front with palm trees and a quiet (except on Sunday afternoons when you will have a grandstand view of AC Siena's matches!) veranda to the rear of the hotel. The en-suite rooms have recently been renovated and are quite simple but comfortable. In order to give the best available rate, prices are on request. Please contact us for a quote. 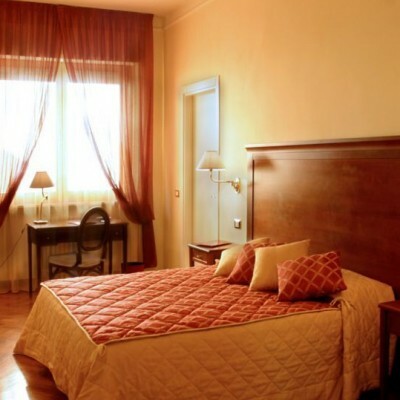 The Hotel Alessandro della Spina is located just 500m from Pisa central train station and just a 10 minute walk from most of the city's main monuments. This modern and cosy property welcomes its guests with an elegant, warm atmosphere, enhanced by its charming garden, and friendly staff that are always on hand to ensure you a relaxed stay. Hotel facilities include internet and wi-fi access in the lobby and a bar and comfortable seating area. Guest rooms are spacious, furnished with wood and marble and have air conditioning, a safe and satellite TV. Buffet breakfast includes homemade bread and croissants. Transfers included from Pisa airport at 11:45 (10:30 Saturdays), and back to Pisa airport at 09:00 (07:45 Saturdays). Over 2 and under 12 sharing with 2 adults. Every two days from 29th Apr 2019 to 22nd Oct 2019, for 10 nights. All dates are subject to availability, please contact us to check. It is possible to hire electric bikes for this holiday at a supplement of £275 per person. As these are available on a first come first served basis, we recommend early booking to avoid disappointment. It is possible to hire tandem bikes for this holiday at a supplement of £195 per bike. As these are available on a first come first served basis, we recommend early booking to avoid disappointment. Road bikes (Willer Ultegra) are available at a supplement of £329 per person. As these are available on a first come first served basis, we recommend early booking to avoid disappointment. Due to the tailor-made nature of our holidays, we need a little more information in order for us to check availability for Classic Chianti Cycling. Simply complete the form below and a member of our sales team will contact you (when it's most convenient for you) to provide availability information, travel options and an accurate price. Of course there's no obligation, but if you do wish to proceed with a booking they will be on-hand to assist you throughout the process.